Sterling silver liquor set featuring elegant nature details, bringing the outdoors in. 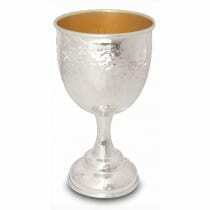 Hand carved branches twist around and extend out of the stem of each cup as grape vines grow upwards, covering the bottom of the cup’s bowl, which seems to glide up and widen, creating an elegant open-top cup. Watch the light of the Shabbat candles glisten and dance on the smooth silver, and glimmer through the gold interior, which ensures that the taste and quality of the wine are perfectly retained. 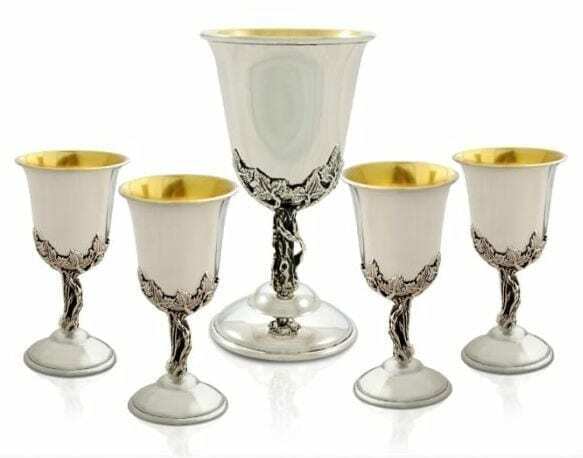 Each set contains one large Kiddush cup and four matching smaller liquor cups, creating an elegant garden of silver beauty. Our artist, Avi Nadav, is a third generation artisan from a line of silversmiths who passed down the art of making these special and unique items from father to son. * NADAV ART stands behind this product and offers a ten-year warranty. The warranty does not cover any damage caused by irregular use of the product such as scratches. * NADAV ART offers a free service of annual professional cleaning. In order to get this service, the customer must come directly to our workshop located in Jerusalem. NADAV ART will not provide this service to products sent via mail.